In years past, I have been quick to criticize the joys of Road Biking. I myself was a roadie for many years in my youth. In fact I entered a number of events and even rode up to 250 miles per week. Then I got into high school and cars and so forth. 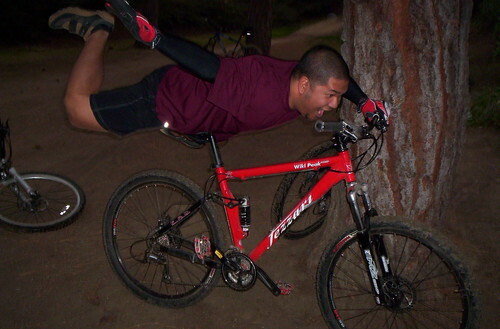 Then about a few years ago I rekindled my love for bicycling, but this time it was with mountain biking. Moe and I actually started a make shift team called “Team Zoom.” We were basically a bunch of weekend warriors that loved to ride. Then at one point Moe along with a Team Zoom member bought themselves road bikes and started riding the pavement more than the dirt. I was pretty brutal in my opinions and called road biking “boring”, “dull” and many other adjectives that described it as a non-exciting sport. Anyhow I’m here to eat crow. I am officially apologizing to Moe for calling road biking the names I did. The reason behind my revelation was contributed by the use of the Ibex Corrida. Last night I decided to take the Corrida for a spin and saw a hill that was calling me names. I had to climb it to silence the voices. Then when it was time to head back, I went down the hill. In my previous attempts to ride this hill with my mountain bikes, I’ve only been able to hit 40mph. But last night was a different story. I was able to hit 45mph! That is the second fastest speed I had ever gone on my bicycle. The first time was when I was a roadie back in the days of age 13. I hit speeds over 55 mph! I couldn’t believe the amount of adrenaline and endorphins hitting my brain and body! ROAD BIKING IS AWESOME! Again, I am sorry Moe for making fun of you and I will never do it again. No need to apologize, cycling is an awesome way of life. If you ride the road, the dirt, the track, the jumps, the mean streets. It’s all good.